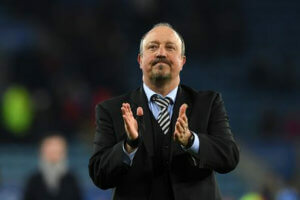 It was not surprising that Rafa Benitez told BBC Sports after the win at the King Power Stadium that he was pleased with the performance, the win and getting all 3 points. Rafa’s game plan seemed to work perfectly but he points out that was due to the intelligent hard work of his players who sat back and gave possession to the home side who ended up with 70% of the possession. But that means little these days. It’s what you do when you have the ball and not how long you have the ball. We have four games left and all of them are winnable games. Just watched the last few minutes of the recording and had to laugh as Ayoze nearly walked off with the Sky microphone. Just goes to show the fickle nature of football, I thought we played better against CP and lost, although we were good value for all three points tonight. How many games do Cardiff have left to play, Ed’s table shows 6 but according to Sky it’s 5? Evening, managed to watch the game yet? Is all of this travelling down to your imminent move to Michigan? No, will watch the game when I get home tomorrow. Arctoa’s ever immaculate summary of the match, taken from the Guardian’s letters, for those who failed to see or hear coverage first hand. “A perfect riposte to those abominable clappers! Benitez made two changes for this one – Paul Dummett came in for Florian Lejeune, whose season is over. DeAndre Yedlin dropped to the bench on the back of a couple of indifferent performances, replaced on the right flank by Javier Manquillo. The game saw a committed and breathless start from both sides, with Newcastle forcing a corner and a save from Kasper Schmeichel – via the head of Jamaal Lascelles – inside the first minute. Leicester broke forward straight from the restart, and an effort form Jamie Vardy called Martin Dubravka into action. However, play quickly settled into a predictable pattern of Leicester dominating the ball and Newcastle attempting to intercept and break, but the highly drilled nature of both teams meant that the game hit a stalemate of closed-down spaces and pedestrian passing. Salomon Rondon almost turned that routine on its head on the quarter-hour mark, hitting the angle with a curling shot from a free-kick conceded by Wes Morgan. According to BBC Newcastle, Rondon has found the woodwork six times this season – an impressive feat given the relative rarity of our forward forays. Leicester were unsettled by Rondon’s warning shot, with Wilfred Ndidi in particular guilty of some slapdash passing on the edge of his own box – and despite not seeing much of the ball, Newcastle were looking significantly more dangerous in attack. The pressure paid off on 33 minutes as a first-time Ritchie cross from the left found the head of Ayoze Perez, who beat Morgan to flick home at the near post. It was almost 2-0 moments later through Miguel Almiron, but his effort was saved at the post by Schmeichel. Leicester were fortunate to avoid going down to ten men just before half-time – Youri Tielemans came in hard, late, and with studs up on Ki Sungyeung, leaving him in a crumpled heap. Tielemans was yellow-carded for his troubles, but dismissals have been meted out for similar challenges this season. Little changed early in the second half despite a home rush straight from the kick-off. Newcastle outfought Leicester at every turn, with only James Maddison causing problems. Jamie Vardy was nowhere up top while Morgan and Harry Maguire were treading water at the back – a stark contrast to Fabian Schaer and his marauding runs forward. Brendan Rodgers rang the changes with twenty minutes to go – Demari Gray and the disappointing Ndidi came off for Kelechi Iheanacho and Nampalys Mendy, but neither had much of an effect on proceedings even as the game became worryingly stretched. Almiron was replaced by Christian Atsu for the final ten minutes, while Leicester replaced Barnes with Marc Albrighton. Atsu was immediately involved in the action, linking up well with Perez and crossing quickly with his first touches on the ball. Nonetheless, Leicester should really have equalised soon after as Vardy sent a shot over from close range. Credit goes to Dubravka for closing the angles, but not even hitting the target summed up Vardy’s evening. In response, Benitez sent on Mo Diame for Ki in an attempt to close the gaps that Leicester were starting to regularly find. Despite mounting Leicester pressure and a baffling minimum of five minutes added time, the away side held firm and the final whistle confirmed a hugely valuable – and unexpected – three points for Newcastle and the raucous travelling support. The scoreline could’ve been more comfortable had Newcastle’s attacking players been consistent with their final balls into the box, but that’s why they turn out for us and not one of the top sides. Almiron in particular was frustrating in the final third, while Ritchie’s crossing ranged from the sublime to the ridiculous and back again. On the other hand, Perez’ intricate play between the lines was influential, and once again he was well-positioned to score a match-winning goal. Elsewhere, Schaer was again dominant at the back, and a menace coming forward. Have we been sold yet ? Can’t deny the graft the players and fans put in, must admit terrific header n cross for the goal, Paul Kitson still seems convinced his sources are on the money regarding a takeover. Great post match interview pitch side with Raffa. What a fantastic man. He soo wants to stay and take this team forward. ” a first-time Ritchie cross from the left” this quote from Arctora is incorrect. The neat cross for the goal was delivered after Ritchie cleverly knocked the ball beyond the oncoming defender, after faking a first time cross. He obviously fooled more than the Leicester player! Rafa was very animated in the post match, on pitch interview. I was unable to hear his words but he was very enthusiastic and plainly enjoys being at Newcastle. The owner is fool to let him walk away and has no legitimate responsibility towards the club. Watching the match prompted the memory of the 7 in a row 50/50 tackles that we won last season against the same opposition. Yet again the lads wanted it more tonight and proved that the last match was just an unlucky blip. Really impressive performance. It wasn’t particularly pretty or free flowing but the team worked really hard and defended brilliantly. Perez and Rondon were both absolutely superb. Perez got his goal but his touch and skill was fantastic- possibly the best I’ve ever seen him play in terms of trickery. Almiron works so hard but his finishing needs to be more composed- he had one fantastic chance which really should’ve been put away or at least on target. Schar again really good. He has been an absolute bargain and as good as I’d hoped he’d be- when he was at Basel he looked like he had the potential to be one of the best in the world and he still shows glimpses why he was rated so highly. The problem for me is still centre midfield. Without Longstaff and with Shelvey being a mystery we don’t have anyone who can consistently pass through the lines. Hayden is a championship player and Ki is inconsistent which means it’s either Schar to pick the pass or Rondon has to scrap for it (which he’s really good at- he works incredibly hard every minute of every game). Diamé is industrious but not really ever going to run a game. Pity Lejeune’s gotten injured again as I think hm with Lascelles and Schar are the best back 3 we have. Manquillo did okay (better than Yedlin has been- he’s had a poor season) and Ritchie is really fitting into that wing back role now. Anyway- another job well done by Rafa. Unless he’s promised money to spend I couldn’t blame him for not staying, he’s already shown great loyalty when he didn’t have to. He could undoubtedly be managing a Champions League club with 100m to spend but he’s stayed to overachieve with that squad. Still hope the club will be sold. Where’re the billionaire geordies? Or adopted Geordie! I’m not gonna say Anyone’s better than Ashley- I’d hate some oil baron with terrible human rights links or completely illiberal religious zealot to own the club- but desperation is kicking in. We’re at best stagnating with Ashley there- we’ll never get anywhere till he goes. Nicky, belittle Perez all you want. He just got us 3 valuable points and not for the first time. And he also put an English international into international retirement. Chilwell cried himself to sleep last night. Off from bed,pinches myself hard,no it was not a dream, we actually won,thanks goodness.Now upward and forward. What a contrast to yesterday a.m.
from dread to exultation in 24 hours. capable of beating anyone on their day. did anyone notice how perezion is starting to dribble with the ball more comfortably now,on this trend,he is fast becoming a world beater and well done to him,lots of works to be done yet though. And we are still thought to be a championship side.Wonder what we will be with a few better investment in the team!!!! can anyone please enlighten me on what our fans were singing at the end of the game,i do not understand the language. So were safe now and my one ambition for us this season is to beat Liverpool and stop the scousers crowing! Rafa would “love it if we beat them”! Sorry if I sound bitter but they will be unbearable especially with Man U struggling to reach former glories! Anyone who thinks Rafa would like them to win the championship is off the mark. I think they might be dressy that game as we do throw in some strange results! Rondon is my player of the season alongside Jamaal Lascelles – our rock at the back! Rafa isn’t the sort of guy who would field a weakened team in the EPL. And remember each position is worth an extra million or so in prize money. here’s hoping for a win against the Saints next Saturday, then a contract signed with Rafa then, at the end of the season a “Sold” sticker on The Cathedral. Still buzzing after last night, and it’s wor lasses birthday today too, so all in all a great day (game finished around 1am this morning). Oh and does anyone know where the 5 minutes added was from? Seemed like “Fergie time” to me. that puts far too much pressure on our defence. The difference with us is we are no good at chasing goal deficits. Been wondering if some of our players have been studying or learning some of our own HATEM BEN ARFA moves,those runs of schar and perez greatly made me think of BEN ARFA,at least for a second. What a night what a result. Brilliant interview after with rafa. The fans were off the charts. I was on kids duty but caught last 20 mins or so. Only criticism was that the ball seemed to spend a lot of time in the air but I think there was a lot of tiredness out there. My man perez was immense and our DM (can’t remember name) is some athlete. We still need 3-4 players though. 5 minutes was for them to grab a late equalizer or even win the match,but as i posted yesternight,we will take all three points tonight and not only 1 points and that’s what happened,but my 3-1 win prediction went to water,pretty pissed with that. Definitely not ruling out a sale. I think it cud happen.